An officer who died after changing places with a hostage during a supermarket siege in southwestern France will be given a national tribute. He was killed in what President Macron called an "Islamist terrorist attack." Arnaud Beltrame, the French police officer who voluntarily swapped places with a hostage during a siege on a supermarket in the town of Trebes, will be remembered in a national tribute to be held at a later date. The gendarme died on Friday as a result of his bullet injuries. "He fell as a hero, giving up his life to halt the murderous rampage of a jihadist terrorist," President Emmanuel Macron said in a statement released shortly before dawn on Saturday. Beltrame "deserves the respect and admiration of the whole nation." French police have detained a 17-year-old in connection with the probe into the terror attack, which killed four people, including Beltrame. The teenager was friends with the attacker, whom prosecutors have identified as Redouane Lakdim, a 25-year-old Moroccan-born French national. Lakdim was killed in a shootout at the supermarket. On Friday, Paris prosecutor Francois Molins said another person, a woman close to Lakdim, had been taken into custody for alleged links to the terror attack. Molins didn't identify her. On Friday, Officer Beltrame offered himself up unarmed to the attacker in exchange for a hostage. He managed to keep his cellphone on, enabling his colleagues outside to listen in on events inside the supermarket. When they heard shots being fired, the police stormed the building and killed the gunman. Beltrame's mother said her son's courage was in character. "I'm not surprised. I knew it had to be him. He has always been like that. It's someone, since he was born, who gives everything for his homeland," she told French RTL radio on Friday before Beltrame's death was announced. French Interior Minister Gerard Collomb also lauded the 44-year-old officer's heroic action. In a tweet, Collomb said Beltrame had died for his country and that France would not forget "his heroism, his bravery, his sacrifice." The national gendarmerie said its flags would fly at half-staff on Saturday in tribute to the slain officer. The Amaq news agency, which is linked to the "Islamic State" (IS), reported that the attacker was responding to the group's calls to target countries in a US-led military coalition that includes France. The coalition has been fighting the terrorist group in Syria and Iraq since 2014. "Our country has suffered an Islamist terrorist attack," Macron said on Friday, while noting that investigators were verifying the IS claim. Macron also said investigators were looking into how the attacker obtained his gun and when he had become radicalized. 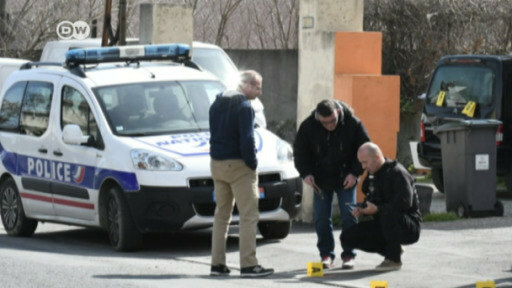 More than 240 people have been killed in France in attacks since 2015 by assailants who either pledged allegiance to IS or were inspired by the group. Police in France have shot dead a gunman who killed three people before holing up in a supermarket with hostages. The attacker was known to police as a petty criminal, though the police did not realize that he had become radicalized.